I took one more step in my never-ending quest to become a respected Internet reporter today. 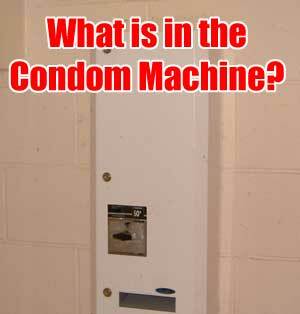 Throwing aside all caution, I braved the possible repercussions and struck out to discover what was in the condom machine. You won't see this kind of hard hitting journalism on CNN, where even now they're whining about some fag on the other side of the world who's having a little trouble with the U.S. No, this is 100% grade A ECG.